SHANGHAI – World championship leader Sebastian Vettel underlined his superiority by storming to pole position for Sunday’s Chinese Grand Prix with the fastest lap ever recorded at the Shanghai circuit. 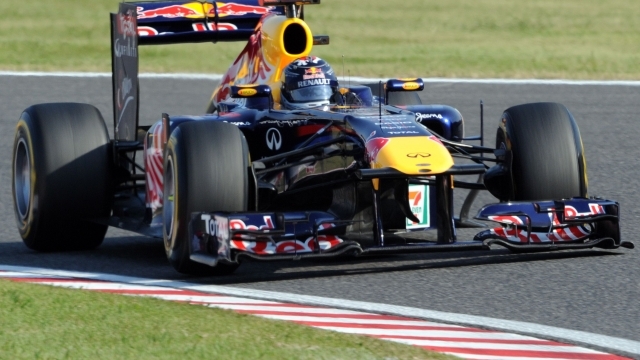 SHANGHAI – World championship leader Sebastian Vettel set the pace in practice for the Chinese Grand Prix, topping the timesheets in both sessions in Shanghai on Friday in his speedy Red Bull. The 23-year-old German, the reigning world champion, has been the dominant force in the opening two races of the year, winning in Australia and Malaysia from pole position. SEPANG – World champion Sebastien Vettel won the Malaysian Grand Prix with a dominant drive on Sunday to take an early grip on the Formula One season. The 23-year-old German steered his Red Bull car from pole position to the chequered flag to win ahead of McLaren’s Jenson Button, the 2009 champion, and Nick Heidfeld who finished third for Renault.